The story of this map begins with a point of divergence in the late 1760s. For multiple reasons, the American Revolution as we know it never occurs, though a revolution does indeed happen. Instead of seceding from Great Britain as one nation, the 13 colonies (in this world, also joined by Canada) fight a war to reform the British government's handling of the colonies and end the tyranny and oppression over them. After a hard war, the revolution succeeds with backing by the Whigs in Great Britain, who help change the status of the North American colonies for good. The 13 colonies, along with Vermont and Canada, are organized into a new sort of colony: the United States of America. This colony greatly resembles the dominions of our own world, with each "state" electing its own leaders except for royal officials and the King of Great Britain himself, who resides over all. The United States itself is a very loose organization of all the former colonies, most of which form their own nation-states except for the Crown Colonies in Florida and Newfoundland. The United States government only has power on interstate trade and taxing, interstate military matters (such as organizing the military when Great Britain goes to war), and other large bureaucratic needs such as those. The day-to-day running of the states falls to their own governments, such as in New York. 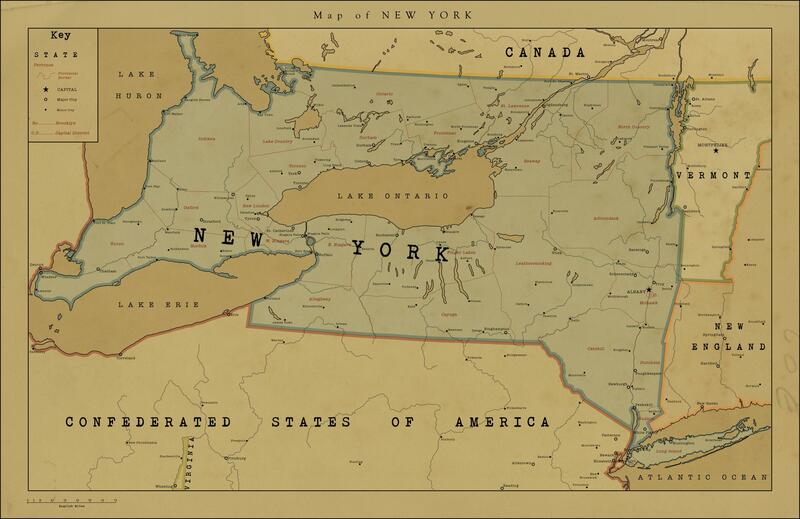 New York held a great advantage from the start, especially after being granted the Ontario peninsula after a surge in pro-New York pride among many of the royalist fighters in the American Revolution. New York also began as one of the most populous states, and continued that trend throughout its history. While starting out powerful did indeed help, the most important aspect of New York's history, however, was the opening of the Erie Canal in 1824 with help of British Royal Engineers. The Erie Canal rapidly increased transport across New York and made New York City the dominant centre of trade in North America, as goods from many nations of the United States flowed on the Great Lakes and down the Erie Canal. New York City surpassed the previous giant, Boston, in greatness and splendour throughout the 19th century, and by the dawn of the 20th it had become the largest city in North America and the second-largest city in the British Empire proper after London. Rail travel quickly became the most popular medium of transport in New York during the late 19th century, and continues on to the current date of the map, 1948. Railroads connected New York City and Albany to the growing cities to the west, such as Rochester, Buffalo, Toronto, Tyron, and Kingston. With these growing cities, more often than not bolstered by the many immigrants who sought land and fortune in New York, there came a rise of a counter-culture to the traditional New Yorker culture. This would eventually split New York into two dominant socio-political groups: the Lakers and Hudsonians. The most well-known of the New Yorkers in the outsider world are the Hudsonians, who, naturally, mostly live along the Hudson. Their area is typically defined to stretch from Long Island up to the Capital District of Albany. Their largest cities are New York City, Albany, and Brooklyn, but even those not in the cities are never far from one. The Hudsonian culture is a cosmopolitan one, resembling more the culture of Paris or Berlin than London due to high-class ideas and styles prevalent throughout every social class. Their art and politics tend to lean progressive and explosive, and the debates held in New York City and Brooklyn are legendary for their ferocity. Due to its dominance in the nation, New York City (sometimes paired with rival city Brooklyn) is often the face of New York, and from it comes much of New York's world-renowned art, literature, radio plays, and music. The Lakers, meanwhile, are seen as the "back-country" or "rural" culture of New York, despite the presence of large cities of their own. The area of the Lakers is not as well-defined, but it typically refers to New Yorkers in the provinces bordering the Great Lakes, particularly Lake Erie and Lake Ontario, but can extend inland as well. These people are typically more old-style conservative and easy-going in their politics and art. If Hudsonians are Realists, Lakers are Romantics, and their way of life shows. Lakers tend to look down upon upper-class displays of wealth and "high culture" instead trending toward working class ideals, media, and ways of life, even in the large cities. Since the economic boom of the 1930s, more and more of the Lakers live in cities rather on farms, but they have taken their values with them. Though not as world-renowned, the Lakers produce many great works of art, literature, music, and radio play in their own right, much of which is popular in North America while the Hudsonian media is popular in Europe. Together, the two cultures blend into a rich and deep socio-political way of life in the nation of New York, which has helped make it the most wealthy and lively of the nations that make up the United States. Though sometimes looked down upon for being made up of Anglophiles by the more independent New England and Virginia, New York has benefited from its close relationship to London with cooperation and economic help during times of trouble. Since the Great War in Europe, the United States has become increasingly powerful from their support of the British Empire, becoming an arsenal of British democracy. However, this has also opened up many new avenues to the United States, as they are rapidly becoming the tail that wags the dog, something of concern and interest to the royal government in London. Only time will tell where the road will lead, but it will undoubtedly be New York who will lead the way. A very pretty map and a very interesting history, though the Confederated States of America bit throws me for a bit of a loop.